This stone was commissioned by the Hidden Brookline Committee of the Brookline Human Relations and Youth Resources Commission. 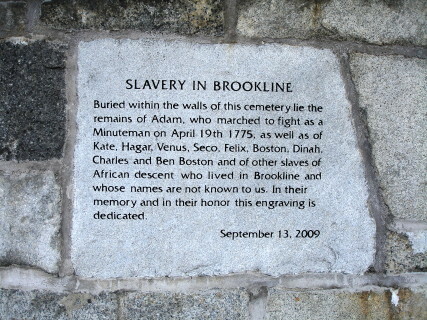 The Hidden Brookline Committee's mission is to bring to light the history of enslaved people of African descent who lived and worked in Brookline. Adam (slave of Isaac Gardner) fought at the Battle of Lexington. Buried in the potter's field* (opposite lots 53-54 on 1842 map). Burial place unknown, possibly in the potter's field. Felix (? ?-1764, slave of Capt. H Sewall) cleaned Town Hall. Buried in Sewall-Wolcott Tomb (r on 1842 map). Buried in Boylston Tomb (y on 1842 map). * The potter's field is described as being at the back of the cemetery. The cemetery was enlarged in 1840, however, so the original back is no longer the back today. Prior to enlargement, the cemetery was less than half of its present size. 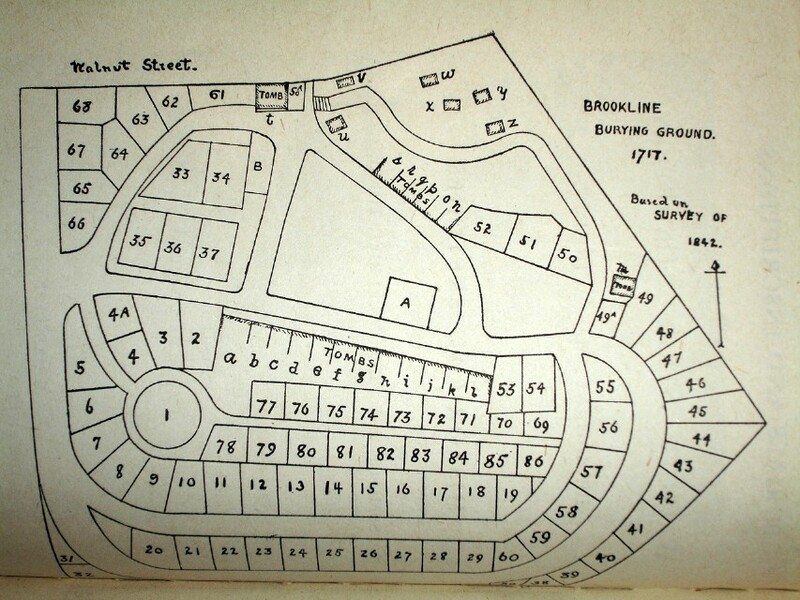 The original Old Burying Ground was a half acre rectangle at the corner of Walnut and Chestnut Streets. The Pierce tomb marked the end of the cemetery on Walnut Steet and the southern row of brick tombs was the back edge. The original entrance was where the Pierce monument is now. A single path ran downhill curving to the left to follow the northern row of brick tombs and then curving to the right when past the tombs. The potter's field was at the end of this path. It was the low point and back of the original Old Burying Ground. Some of the stones in this area indicate the burials are of people from other towns including several Revolutionary War soldiers.